Kantesh Balani , PhD, is an Associate Professor, in theDepartment of Materials Science & Engineering, Indian Instituteof Technology (IIT) Kanpur. He has presented over 50 lectures inthe international conferences and has over 65 publications in thepeer-reviewed international journals. His accolades include the2013 P.K. Kelkar Research Fellowship . Arvind Agarwal , PhD, is Professor of Materials Scienceand Engineering in the Department of Mechanical and MaterialsEngineering at the Florida International University (FIU), Miami,Florida, USA. He has authored more than 200publications, edited 7 books, and co-authored 1 book in the area ofcoatings and nano-biomaterials. His accolades include Fellowship ofASM International. Vivek Verma , PhD, is an Assistant Professor in theDepartment of Materials Science and Engineering at Indian Instituteof Technology (IIT) Kanpur. He is a recipient of the prestigiousAmerican Academy of Mechanics Founder's prize and grant forthe year 2005-06 and Shri Ram Arora Award 2011. Roger Narayan , PhD, is Professor in the Joint Departmentof Biomedical Engineering at the University of North Carolina (UNC)and North Carolina State University (NCSU). He is an author of over100 publications as well as several book chapters related tobiomedical materials. His accolades include the UNC Jefferson-PilotFellowship in Academic Medicine. 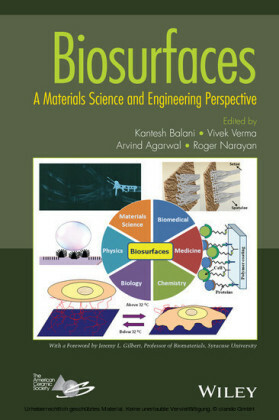 Surfaces are highly critical in dictating the response of a biomaterial, hence the book, Biosurfaces: A Materials Science and Engineering Perspective is targeted for materials scientists, biomedical engineers, biologists, and design engineers to be able to comprehend the importance of biosurfaces and initiate a dialog between them. More importantly, this book provides a perspective of materials scientist and engineer that will allow parallel communication of materials scientists with biotechnologists, practitioners (dentists, surgeons, etc.) and biomedical professionals alike. The contribution of understanding the material, being able to design the bulk components, has saturated in recent past, but the idea of engineering the surfaces and using them as potential sites for targeted interaction in vivo has triggered the research and funding in the area of biomaterials and bioengineering. Since primary interaction rests with the surface, appropriate selection (chemistry), design (surface topography and patterning), and performance (both biological and mechanical) are critical in imparting significant upliftment to the current technological applications. This book encompasses the fundaments of materials, the interaction of biomaterials at molecular and cellular levels, surface and biological characterization followed with engineering aspects for practical dental/bone implants and as engineered devices. This book has been conceived in order to motivate the students (especially senior undergraduate and post-graduate) and young researchers alike. In addition, this book will serve as a handbook for experts for easy referral both in academia and in industry. In this perspective, the present book provides a background and introduces the importance of biomaterials to a reader, who does not have a background on biosurfaces. Furthermore, the book develops the concepts of biomaterials, and provides an insight to the mechanisms and fundaments of designing biosurfaces from an engineering perspective. The book has been structured into various chapters as described in the following sections. In Chapter 1 on Introduction to Biomaterials , starting with the evolving definition of biomaterial, the content covers the classification of biomaterials. Although a complex interconnection of bioinertness to bioactivity is covered in later chapters, this chapter focuses on the class of polymeric, metallic, and ceramic materials. This chapter outlines the associated challenges and utility in terms of selection of materials for specific applications. Chapter 2 focuses on the interaction between biomaterials and the tissue. The role of protein adsorption on inducing cell migration and controlled cell deposition is presented in this chapter. The role of extracellular matrix in supporting the cellular growth, proliferation, and adhesion is portrayed. Later, biologically controlled biomineralization, and its utility in supporting the skeletal system, is depicted in detail in this chapter.